Santorini Brewing Company – a little bit of summer in the middle of winter - Piwo, z piwem i o piwie. Some time ago a friend of mine brought me an unusual gift stright from one of greek islands – Santorini. 3 beers (and many accesories) from Santorini Brewing Company! SBC is the first and only brewery in Santorini and it’s run by „Greek oenologist, a Serbian brewer, an English brewing enthusiast, and an American”. That’s a nice cultular mix, isn’t it? Unlike most of the beers I’ve encountered during my holidays in Greece (Korfu Beers were the only exceptions) beers from SBC are top-fermented in opposite to dominating tasteless lagers. I had an idea to publish this text during heavy, polish winter, something like -30 C, but it’s February and we’ve had maybe 3 days of real winter this year… So you can read it now; just let’s pretend that it’s really cold outside! 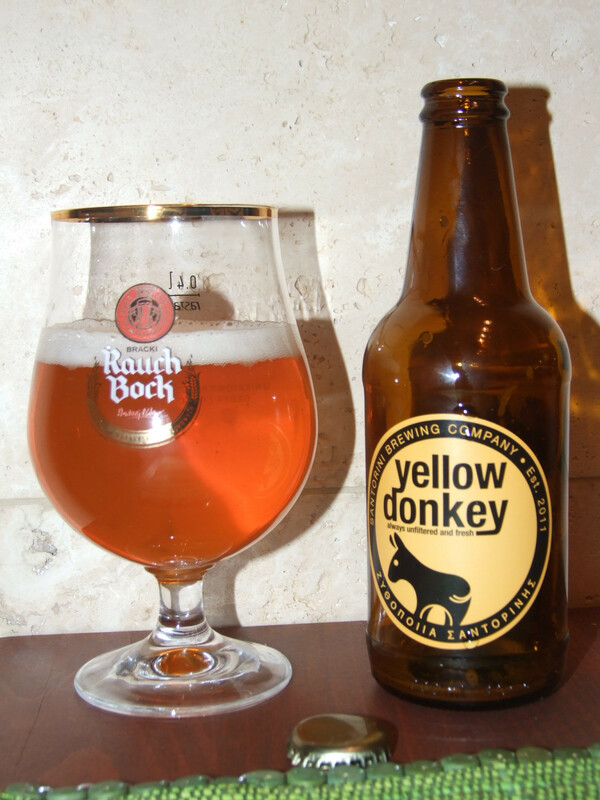 Yellow Donkey is golden ale with variety of hops – Aurora and Styrian Golding (Slovenia), Cascade (USA) and Motueka (New Zealand). Despite the use of many kinds of hops, bitterness is on relatively low level (according to brewery’s web page – 19 IBU). Aroma is quite nice, although not intensive; it’s grainy, with a hints of citrus, flowers and some herbs. And the taste? Right now it’s about 0 degrees on the outside, but I can imagine drinking this beer during hot greek summer. Soft carbonation, low bitternes and a little bit of sweet flavour (also with malty finish) makes it excelent drink for holidays in Greece. Maybe not very exciting, but this one is actualy very refreshing. Stronger brother of the yellow one. 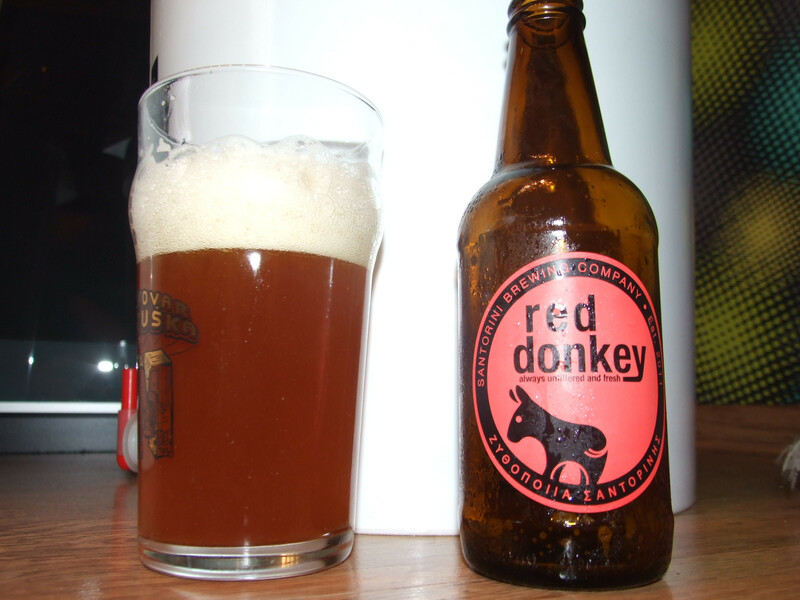 Red Donkey comes with alcohol 5,5% vol. compared to yellow’s 5,0%. Not only the alcohol content is higher; also the white head looks better and lasts longer, but it’s still not the best one i’ve seen in my life. Aroma is quite interesting. Very fruity and floral with some herbs and sweets. Yes, this actually reminds me of a candy! Or candied fruit. Taste brings good balance of hops and malts. A little bit of caramel, moderate bitterness and spices, red fruits and citruses. Good, decent beer, but still there’s better one from Santorini Brewing Company. Hail to the crazy king! One can’t often see this kind of bottles in Poland; that’s a shame, ’cause i really enjoy thes shape. Of course, the inside of the beer is much more important than the outside, but come on – everybody likes to enjoy a nice view from time to time, don’t they? Pouring this beer into a glass took me few minutes – the foam is rather high and it takes a while for it to reduce. However it doesn’t reduce completely – i’ve drunk more than a half of the glass and it’s still more than 1 cm high. Smell is nice – citrus, herbs, a little bit of caramel and spices. With a touch of pine woods… Bitternes is higher than in „colored” donkeys, but still it doesn’t make you want to chew your tongue off. The malty side is accurate to counter the bitternes; and yet we can taste some fruits, flowers and citrus. For me the carbonation is a little bit too high, but of course I would like it better while drinking this beer in hot Greece, not cold, eastern Europe (where of course we live in caves and bears walk on the streets, according to some western urban legends). So? 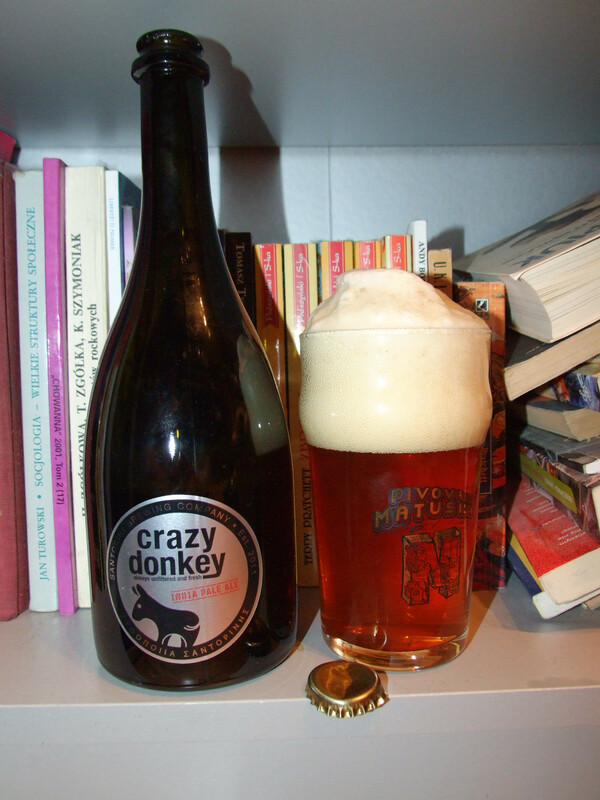 So Crazy Donkey is a good, decent IPA. Propably the best greek beer i’ve drunk so far; but, to be honest, I’ve tried maybe 10 different kinds. But still – long live the king!